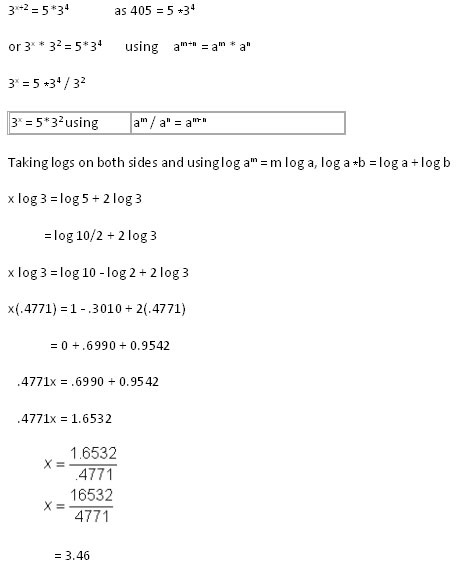 We will take logs to the base 10 as we are dealing with common logarithms. 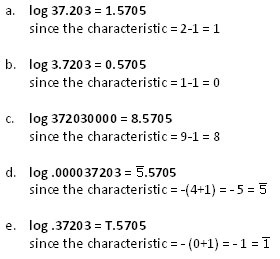 From the above cases, it is clear that the logarithm of a number increases as the number increases and decreases as the number decreases. It also follows that if a number lies between 0 and 10, its logarithm lies between 0 and 1. 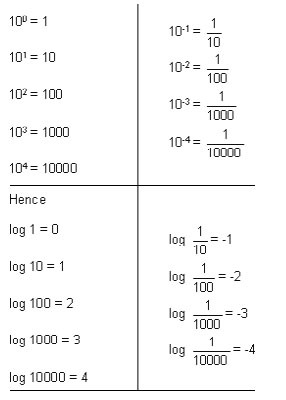 If the number lies between 10 and 100, the logarithm lies between 1 and 2, and so on. 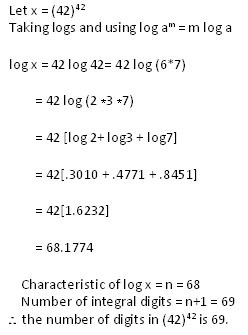 So, the logarithm of a number is partly integral (that is, it is an integer) and partly fractional. The integral part of a logarithm is called the characteristic and the fractional or decimal part of the logarithm is called the mantissa. If N, the given number, is less than 1; that is, it is a fraction or decimal and contains the first significant figures after n zeros (for example, in .0000561 the significant figures are 561 after four zeros) immediately after the decimal point, then as stated earlier it follows that a decimal fraction with no zero immediately following the decimal point lies between 10-1 and 100 (for example, 0.34). A decimal fraction with one zero following immediately after the decimal point lies between 10-2 and 10-1 (for example, 0.0519), etc. 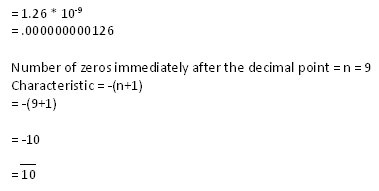 Thus, the characteristic of the logarithm of a decimal fraction N with n zeros following the decimal point is -(n+1). with the same significant figures. 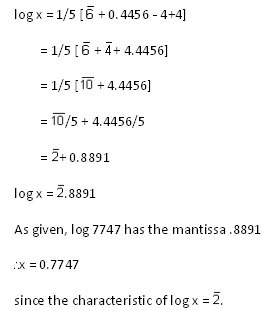 1) 3125, 31.25, 3.125, 0.3125 and .0003125 have the same mantissa, although their characteristics are different. Sometimes, we may obtain a logarithm that is wholly negative. 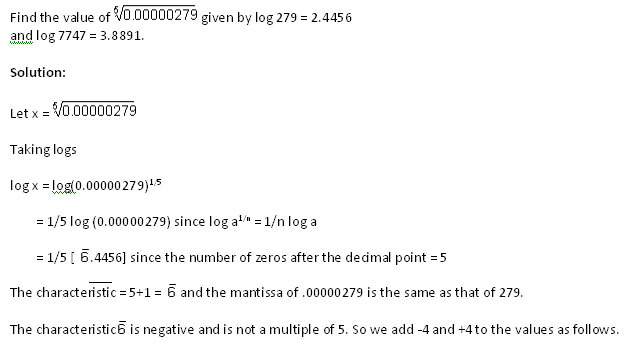 In this case, we need to use arithmetical operations to write the logarithm so that the mantissa is positive. The result -2.17985 may be transformed by adding -1 to the integral part and +1 to the decimal part. 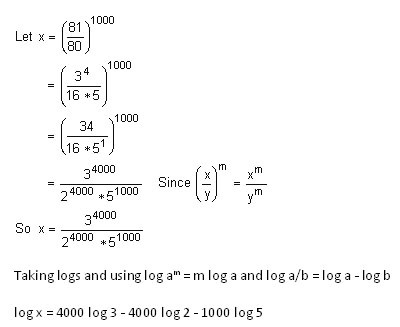 Given log 2 = .3010 and log 3 = .4771. Find the numerical value of x in the following equations.